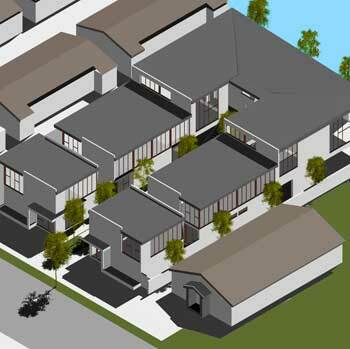 A proposed 12 unit studio courtyard housing project located in Atwater, California. The project will extend and complete the existing 18 unit duplexes and cottages of Perlita Gardens for a total of 30 units on a 1 acre property. The expansion will total 7,000 square feet. The project required a general plan amendment and zone change from the previously down zoned R1-1 to the appropriate RD2.1 The two story project will include 20 foot spaces, 15 tuck under parking spaces, open space w/ required lush at grade landscaping, self contained units with full kitchen and laundry as well as provision for a loft.